"What makes Higgins' work so fresh is that the objects of his wrath are both contemporary and powerful. He does not kick people when they are down, like the fake satirist, or flog dead horses for a comfortable audience. His targets are doing damage now and he's out to get them... No, Higgins is not Swift but I still hope they'll put up a plaque to him in Galway Cathedral - or spray paint one of his poems on a wall, which would probably please him more." "Gifted poets like Kevin Higgins rescue language from the 'blatant blather of knaves' in which it is immured, and harness its vitality to tell it like it really is." 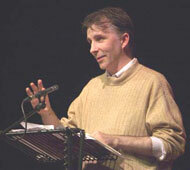 Kevin Higgins was born in London in 1967, and grew up in Galway City where he still lives. He is co-organiser of the highly successful Over The Edge literary events. His first collection of poems, The Boy with No Face, was published by Salmon in 2005. The Boy With No Face was short-listed for the 2006 Strong Award and has recently gone to its second printing. He is the poetry critic of The Galway Advertiser and also regularly reviews for Books In Canada: The Canadian Review of Books. A collection of his essays and reviews, Poetry, Politics & Dorothy Gone Horribly Astray, was published by Lapwing in 2006. Kevin has read his work at most of the major literary festivals in Ireland and at a wide variety of venues and festivals in Britain, France and the United States. He won the 2003 CÃºirt Festival Poetry Grand Slam and was awarded a literary bursary by the Arts Council of Ireland in 2005.
one of these days. And Prague? Budapest? "Not quite here, yet not quite there. Review by Will May, Southampton University in The Irish Studies Review, Vol. 16, No. 4, Nov '08. In one of the most successful poems from this collection, 'The Couple Upstairs', an abandoned wife listens for the tell-tale sound of the Penguin Book of Poetry From Britain and Ireland since 1945 dropping from a neighbour's hand as he and his partner 'commit an unnatural act / on a Tuesday afternoon'. The image is typical of Kevin Higgins, whose speakers are always hearing something not meant for them, or deliberately refusing to listen, cocooning their loneliness in resentment or accusation. The Penguin anthology casually dropped for an afternoon's love-making is also suggestive of Higgins' puncturing bathos; here the post-war canon is cast aside whilst the aggrieved reader bangs their walking stick on the ceiling, anxious about what might happen next. In fact, this apparent iconoclasm is deceptive; Higgins may well have learnt his poetic styles from a Penguin, with his generous doses of Larkinesque despondency and inventories ('To Sunday Evening'), Martian humour ('Original Bohemian Writes to Ex-Boyfriend About Astronomy'), or poetry slam swagger. However, if the poetry is formally conservative, its political shift from his first collection The Boy With No Face in 2005 makes it a much richer platform for Higgins' humour and satire. Here, the London-born Galway poet turns the parodic eye on himself, and gently mocks his radical socialist past. In seventy poems grouped into five linked sections, Higgins rakes over the coals of his own political mission, his obsession with Trotsky, his association with the Galway Left, and his teenage commitment to put 'some fascist through / a glass door arseways' ('My Militant Tendency'). It is, as one poem's title has it, a 'Conversation with a Former Self', and whilst at times its modern-day targets are rather too easy, as in 'The World Socialist Party of Honey Suckle Heights', it is more often clear-eyed and generous satire. If the collection is always conscious of Higgins' political inconsistencies and contradictions, it also admits to one or two of his poetic Achilles' heels. In 'This Small Obituary', Higgins imagines his legacy as a poet with 'a real knack for last lines', whose preoccupation with his own invective eventually kills him. In fact, Higgins' much touted ire is rarely on display here, but when it cuts its marks are incisive and clean. His disquisition on terrorism is thoughtful where from so many pens it would have been heavy-handed. ('Reasons for Doing the John Walker Lindh'), and his tone is one of poignant vitriol for 'the saddest man / in the history of sad' ('The History of Sad'). Only in 'Firewood', where he intersects the poem with newspaper reports from the Darfur crisis does the Orwellian anger seem to bubble over into the glib or the over-burdened. More often, humour rescues Higgins from the abyss of portentousness, whether in his portrait of the militant protestor who changes his name to 'something, which roughly translated / from the old Irish means / "bringer of spasms" ' ('The Cause'), or the quiet sense of catastrophe which descends 'on the Essex side of the M25' ('Ending Up'). "The challenge for those who believe art should have real purchase on contemporary debate is always how to write the engaged political poem while still making it artful." Siobhán Campbell, MA/MFA Course Leader, Creative Writing, at Kingston University, London. "Why bother with political poetry, just send me a text," A comment made by a radio host recently as part of a debate about the role of poetry as a political actor. Kevin Higgins is probably one of the few poetic writers I can think of who has garnered respect in both the slam/spoken word arena and in the literary world. This is no mean feat as often the two worlds, sadly, live separate and sometimes antagonistic lives. In a period where poetry of both hues is attracting a growing number of participants in Ireland and Northern Ireland, as well as a wider audience, Higgins is a bridge between those worlds. He has also gained a reputation as a poet who writes politically, again no easy manoeuvre to carry off successfully. It is some challenge to be poetically and politically credible. His first book, "The Boy with No Face" was peppered with revealing thoughts on a myriad of issues, but particularly those connected to the changing face of Ireland under the impetus of globalization and the Celtic Tiger. His writing concentrated on unmasking the corruption, the greed and the recklessness of unrestrained free market capitalism, while recognizing (and warning the reader of) the weakness of the provincialism of old Ireland as an antidote to this. There was no going backwards, the question for Higgins was "where is it that we are heading towards?" He attacked the loudmouths, the hypocrites, those who revere or accept the mundane. He warned also of the potential to see a rise in racist and fascist ideas and in his least restrained moments, there were "suggestions", sometimes bold suggestions, that there is merit in resistance. Now this was all done with a witty irreverence. Most of the poetry was short, pithy, sharp. Not a word wasted. And it was at once accessible and substantial. Not an easy barbed wire fence to straddle. His latest book "Time Gentlemen, Please" is darker and denser - there is a little more experimentation with form - it feels less "youthful". From the opening strains of dealing with life as it actually turns out - so often a long distance from dreams and desires, to the sense that "maybe this time things will be different,"
this is the end of the old regime"
And breaking free of the mundane, breaking free of what little Capitalism offers us, is only one of a number of overarching, interconnected themes; the fear of the future, handling the death of a father, dealing with difficult family relationships, losing the immature political orientation of youth with an attendant warning against dogmatism. And what is a prominent strain throughout this book, the inability to maintain a commitment to a particular strain of socialist politics, in Kevin's case the Militant tendency, but he points the arrows quite widely here and pretty much at anyone who embarks on this path. The aim is to introduce a much wider discussion than just a personal journey; it is to turn attention to the revolutionary socialist left, to their foibles and weaknesses. In this way it is a more ambitious book than the first. Higgins is intertwining the personal with the widest possible issue, the re-organisation of society politically and economically. If the mundane and the grind are to be challenged what is the alternative? He is his first target, asking himself where did his commitment to a certain ideological orientation go, he is questioning whether or not such a commitment was/is warranted, realistic, realiseable - and finally what does this mean for life in general and the life of any particular individual. Now, before you groan, this isn't sombre reading. There is plenty of the frivolity and humour which characterised the first book, he writes of his marriage, of relationships, of the need to constantly dream and desire and after the struggle, and just to add a touch more tension to the mix, we get to contemplate the question of death. - to the 68'er who just can't move with the times in "From Grosvenor Square to Here"
This is how it would sound. To me this is exciting poetry - I would challenge anyone who gets this book to read these works aloud - and read them loudly - they roll rhythmically - they stick in because the words create the rhythmic tension necessary for the memory to grip into the ideas being expressed. They demand you to think through the issues - you cannot escape them because each is at once, nuanced and sharp. The target is the connection between the ideal and the ideas realized in practice. Between the disconnection between what people say and what they do or end up doing, between the surface phenomena and the underlay, the gap between the end goal and the often disappointing reality that we still have a long way to go. Can we really say, as Higgins admits he once did, that Socialism is the answer? Of course, when you start down this road poetically and politically there are bound to be minefields ahead. While he raises a number of insights, while he forces you to contemplate, Higgins manages to steer himself on to less solid ground and it is here where there are difficulties in the flow of the book. Quite a deal has been written about Firewood - the poem about Darfur in which he contrasts a sentence or two from an article in the Socialist Worker newspaper to the eye-witness account of the savagery of the Janjaweed. The ideas Kevin expresses here really are a pretty standard view of the conflict in Darfur - ruthless executions, genocide perpetrated by the Janjaweed, and the use of the words of an eyewitness account cannot but move the reader. But Higgins hints that there should be military intervention to solve the problem. That means we have ventured much further that just insight here. There have been plenty of similar opinions expressed about Darfur so that really should come as no surprise - the problem is that the poem is moralistic and it only leads in one direction without much in the way of sophistication. It is blunt and it reads that way. This in my view weakens it. There isn't room to elaborate here on a wider analysis, although it is enough to say that Darfur really does need careful treatment, and I would point people in the direction of the poet Afeif Ismail, the Sudanese exile who, while absolutely hostile to the Sudanese government and the Janjaweed, manages to convey the complexities of the situation far better, and in thinking through the solutions, if I remember correctly, points in the direction of providing food on a grand scale rather than adding to an already substantial armory. his pickaxe voice rips the High Streets"
- Things as they are! Things as they are!" Now taking these two issues at hand, Kevin might say, in his defence that in the first instance he was just concerned about the clumsy, insensitive use of language in a far-left newspaper, and in the second to show up the distance between rhetoric and reality. Perhaps he may have a point (I couldn't find the article he takes the quotes from so I have no way of knowing) but I'm just not convinced that this takes us very far. And Higgins does have far weightier, sharper and more poetically challenging material which creates that tension between the ideas and arguments that he wants people to think about. would do the same again and worse"
A cat flap somewhere opens"
Gordon Hewitt is a performance poet from Belfast. He performs regularly with the performance group Screaming Blue Murmur who are based in Nothern Ireland. In the annual Poetry Society UK lecture, 2008, Eavan Boland gave a riveting critique of what has happened to the political poem in recent times. One element of the discussion was whether poetry has become too polite, too refined, and too engaged with monitoring its own processes to look out into the world in order to see clearly the processes which control us. Over her career, Boland has often written about poets having to have the freedom to write the political poem, to ask where authority resides and who will contest it. Having read Higgins' poem in Democratiya 14, 'Letter to a full time revolutionary', I thought that perhaps here is a poet, not affiliated or constrained by funding or other patronage, who might be answering those questions. I opened Time Gentlemen, Please with a sense of anticipation. In five sections, this is the kind of book that draws a reader in by often placing poems in loosely thematic order but also mixing it up to have pieces relate to each other in surprising ways. The atmosphere of dread tempered by wit is encountered in the first section, 'From the future, a postcard home', and mirrored in poems of retirement and death in the final grouping, 'Last Testament'. Despite an insouciance of tone with lines such as 'The father who took forever to die' or 'your autobiographical masterpiece: Tribute To A Nonentity', there is an edge to these short lyric pieces. They have a tendency to nod towards a deeply felt emotion that is marshalled by a commitment to humour into poems which ride the cusp between a laugh-out-loud, but utterly forgettable moment, and something deeper and more lasting. It becomes clear that this is a poetics concerned both with how the world works and with what freight words like 'arse' and 'toilet brush' can carry. In a poem like 'The Cause', we might expect some reference to the particularly Irish use of that word in relation to the Troubles, but instead are treated to what begins apparently as a gently satirical look at another 'diminished' fighter of the good fight, 'Each morning he decides what he's against today'. However, the piece progresses rather too rapidly to a bathos that seems unearned, where our anti-hero 'nibbles the firelighters under the rusty ironing-board he now calls home.' And perhaps that is a marker of the less successful poems here: that they wear their actual cause too lightly to be taken seriously, while they take on, almost too emphatically, a perceived need to entertain. What is good about the book, however, is that the most memorable pieces show a capacity to do both things well: employ the tricks of the send-up while commenting on the supposed liberal tendencies of the reader at the same time. 'My Militant Tendency' opens beguilingly, 'It's nineteen eighty two and I know everything.' It's a poem which could do with being longer, and that's something a reviewer can rarely say. There's a movement here through football fandom to Liverpool as 'the Petrograd of the British Revolution' which will speak to almost any reader, whether a middle-aged leftie or not. The ending has that touch of personal humane observation that characterises the 'I' in the poems: 'watch / my dad's life become a play: Sit Down in Anger.' It's true that this 'I', whom we might suppose to be the poet himself, is also addicted to self-referential warning against being taken too seriously. As he has it in 'This Small Obituary', 'He had a real knack for last lines/ but fell in love with his own invective.' The danger here is that the poet may make it more difficult for himself when he wants to switch tonal register to encompass either contemporary politics or a meditation on death as the supreme anti-authority. In terms of the former, the ventriloquism of 'Firewood' which employs quotations from eye-witness accounts of Darfur, connects intent with form in controlled eloquence. The mirroring technique employed, where the second half repeats to both amplify and un-tether the phrasing of the first, serves to make this one of the most memorable poems in the book. Both this piece and the fine unrhymed sonnet, 'Retirement', show a poet capable of using form to his own ends. If it is the case that a commitment to free verse is part of a political anti-authoritarian stance on the part of this writer, then it would be doubly interesting to see what might happen if he brought his clear appreciation of the possibilities of form into focus with his underlying quest for what will replace that 'militant tendency'. The notion of a poetic persona who cares deeply but laughs loudly is somewhat dented by certain poems in the final section. Pieces like 'December' and 'Hospital' begin to engage with that old and essential poetic chestnut: death. Death and personal loss become the subliminal themes which remain with a reader of this work after the jokes have faded. The moving piece, 'Ending Up' is one of the few poems allowed to carry on over a page. The increased length seems to liberate the poet. Here he can show his capacity for insight into the human condition of never being enough for oneself, rather than closing down any such exploration with a punch line. The overall impression is created that there are two poetic personae at play here and that stronger, more sustained and more serious work might emerge if the poet took his own talents a tad more seriously. Throughout the work, the modulation of the voice is impressive and a reader feels the presence of a humane sensibility, one that is sometimes moved to outrage. This is work which raises the issue of what the political poem can be, for us now, in our several cultures. That it begs the question is testament to pieces which tantalisingly suggest that this poet may yet match an originality of approach with sustained subject matter. The challenge for those who believe art should have real purchase on contemporary debate is always how to write the engaged political poem while still making it artful. Kevin Higgins is a poet who could certainly go into this poetic territory, should he wish to. I, for one, hope that he might and will look out for his next book with even more anticipation. In basements; I promise to abolish double-chemistry class? The power of this lies in suggestion, in the well-observed ordinary moment, which is Higgins' real gift. The best of the poems are smart vignettes, character studies, accounts of the telling moment. When I moved to Galway, Ireland in the summer of 2007 from Dublin, I was informed, by various characters in varying states of sobriety, that the man I should seek out was Kevin Higgins, who, with his wife, Susan Millar DuMars, runs the successful Over the Edge series in Galway. And those folks in Dublin were right. Kevin was one of those guys one wants to know-he and Susan are supportive of local talent without a hint of parochialism and have (along with others, to be sure) done much to make Galway an exciting place to be a poet. But what does this have to do with Time Gentlemen, Please (Salmon, 2008), Kevin Higgins's second book? Well, in one sense, relatively little. There are plenty of examples of founders of influential writing groups and important reading series who - well - can't write for squat. Likewise, there are plenty of very good poets who just can't seem to get along with the human race at large. The skills required to be an advocate for poetry-its public presence in a given place-are somewhat distinct from the ability to write well. But it certainly doesn't hurt either skill set if one has both. And Higgins, to his credit, is a good poet as well as being a good organizer and advocate. "Instead of masturbation, I find socialism. the minute I become Commissar -"
But the disillusionment sets in as time goes on. In "The World Socialist Party of Honeysuckle Heights" a branch meeting is "[l]ess the vanguard/of the proletariat, than a dinner party/that kept not happening", and the protagonist in 'The Cause" degenerates from 'the campaigner" to "the mad fucker with the sign". These poems capture that sense one can get manning a literature table at a demonstration, of being somehow adjacent to history but really not shaping it. Whether it be the late British Trotskyist leader Ted Grant poring over the newspapers while drinking endless cups of tea ("Death of a Revolutionary: Ted Grant"), or the narrator imagining that the guy running a B & B in rural Ireland "is ex-Romanian army" ("The Great Escape") the poems are haunted by a sense of broad social forces at work, and Higgins's evolving attitude toward them. Coupled with the retreat of great ambitions on the political front is a parallel recognition of the difficulties the personal lives of those around him. In particular, Higgins's father, described in "Family Dispute" as "the sad man in the caravan/who keeps coming back/at me in poems" is a repeated presence. Just as history can be uncooperative with Marxist theory, likewise the life of an individual is revealed as unconducive to more modest five-year plans. it won't happen. This best June day. The sun extravagant, the music starting to play -"
And Higgins, to his credit, may have disavowed some of the ideas of that young messer of a revolutionary on his winding path to the aisle, but he still clearly likes and sympathizes with his former self, and he always stops short of an endorsement of the status quo. Though no longer a revolutionary, he remains a rebel. On occasion, the book does wobble a bit. One of the problems with having a sense of humor as a poet is that it can lead to a comic rather than poetic closure. Higgins generally avoids this, using the comic to bolster serious points with a great deal of verbal ingenuity. But in a few poems, such as "Keyser Soze Does Not Frighten Me", one senses the presence of a borscht-belt comedian in the white space of the right-hand margin whispering, "Take my wife-please!" But such moments are rare, and even if they don't quite match up with the general incisiveness of the book, they do remain funny. Time Gentlemen, Please is not only a good collection, but it establishes Higgins as a writer who is not only doing something no one else is doing, but who is doing it well and getting away with it. And we should be glad he is. "Kevin has established himself as quite a funny, satiric poet, but with a very serious edge to him. This firmly establishes his reputation. It's well worth having, this collection of poetry. A delight to read at any time." Kevin Higgins recently had this said of him, in Justin Quinn's The Cambridge Introduction to Modern Irish Poetry, 1800-2000, "Chapter 12, The disappearance of Ireland": Kevin Higgins (b. 1967) has demonstrated a good satirical savagery when facing the new Ireland. His first collection, The Boy with No Face (2005), contains many poems in conventional lyrical modes (in which he is weaker) and others with a social critique as lithe and imaginative as that of the con-merchants who run the show. He has perhaps acquired much of his sharpness by taking part in poetry slams. ... A satire which eschews moderation and openly admits its own savagery can only succeed. His second collection, Time Gentlemen, Please, is just out with Salmon, in Ireland. I think it is an extraordinary book, easily better than The Boy With No Face. There are any number of rising Irish poets, at any time, but Higgins must now count high among that list, alongside Wheatley, Morrissey (who recently won the National Poetry Competition), and a few others. They are very good, very intelligent poets. Higgins is something else. He has something that I admire, as a critic, more than anything else: style. Not just style, a completely original style. Indeed, though I usually cringe at this term, he has a "voice" all his own. Or rather, his voice combines elements from other voices - Orwell, Morrissey (of The Smiths), Larkin, Kavanagh - in ways no one could have expected, or defended against. His tonal elements are unique because his own ontological position is so (in this sense invalidating the argument that language writes us - sometimes Galway does): he writes of miserabilist experience, down and out in Ireland, as a former Marxist now happily married, and seeing the onanistic error of his former ways. This grim, ironic, and rather acid backstory is combined with a pointed use of quasi-surreal image, and startlingly sure and nasty quips, that almost constitute a new sort of trope - half-metaphor, half-gripe. A lot of poets play with the punning equivalence between Karl and Groucho - but Higgins really does bridge the worlds of Marxist theory, and Marx Bros. praxis, with steely verve. I think he is the funniest Irish writer of his generation - which is saying a lot - and no other Irish writer has ever made me laugh aloud so often, other than Oscar Wilde. In some sense, his poetic is the reverse of Wilde's - a fart for fart's sake - as he avoids beauty and aims directly for "Truth" - which he then skewers. I'd say he was a Swiftian satirist, but that would belittle his poetic achievement. The poems, themselves, are aesthetic objects, full of complexity, irony, and nuance. He is simply the very best comedic poet of his Irish generation. But I must go further - he is the best politico-comedic poet - which is a rarer, and stranger combination (one thinks of Paul Durcan, but even he can't hold a candle to Higgins). I suppose I could name drop all day, so I want to quote a few lines. The collection is in five sections, and offers a generous 70-plus worth of poems - enough for two slim volumes from some presses. In almost every poem, something happens that is jaw-droppingly odd, and usually involves an unexpected simile related to the shabby world of local or global politics (or the shabby streets of Galway, before the Celtic Tiger); in a sense, Higgins has found his objective correlative in Pravda, or CNN - as encountered in a grimy pub. He has transformed and updated Eliot's sawdust floors, and found new equivalents. No other poet writing in Ireland is as actually modern, or accurate, in connecting the flaws in human experience, to the ways of poetic expression. He's Prufrock, marooned in the West of Ireland, and no less cosmopolitan - the world has come to Galway City, at long last, via undersea cables. IS THE far left dominated by bullies who have abandoned many of their principles to 'get into bed' with questionable elements? Is it time for the Left in Ireland to look hard at where they are and what they stand for? 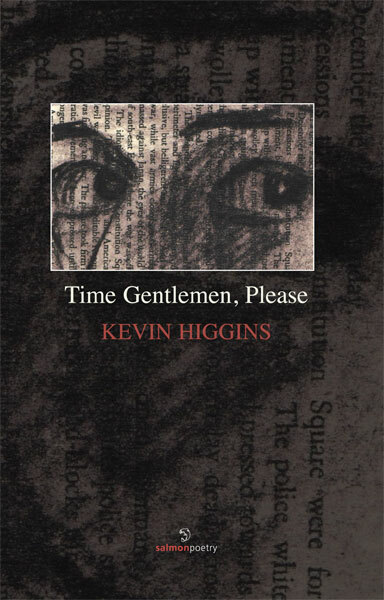 The acclaimed Galway poet Kevin Higgins will launch his second collection of poems Time Gentlemen, Please in the Galway City Museum, on Saturday at 1pm. The guest speaker will be Michael Gorman. Time Gentlemen, Please is divided into five sections - From The Future - A Postcard Home; Ponders End; Firewood; A New City; and Last Testament - and through the personal and political, presenting a picture of where Kevin has come from, and what he is now. It is a theme which comes across most strongly in the poems dealing with politics. Here the poet casts a critical - but always witty and desperately funny - eye over the Galway Left, its stance on the world, and his own role in it. "In poems such as 'My Militant Tendency' and 'To Curran's Hotel' I look at my own political past when I was a member of Labour Youth in Galway and a supporter of the militant tendency," Kevin tells me. "Poems such as 'The Cause', 'From Grosvenor Square To Here,' and 'The Annual Airshow Protest' poke some more savage fun at my old friends on the far left." There is likely to be many a discussion about who Kevin is referring to in 'The Annual Airshow Protest': "The man, who every chance he gets/ticks you off for bearing false witness/against East Germany, hands out red balloons./His moustache stops to congratulate itself./His heartbeat hammers: Long Live Stalin!/Long Live Stalin! A guy with purple hair offers Food Not Bombs to an elderly/white woman with dreadlocks". Yet Kevin is also merciless in poking fun at himself. In 'My Militant Tendency' he remembers wanting to put "some fascist through a glass door arseways, but being 15, have to mow the lawn first" before proudly declaring: "Instead of masturbation, I find socialism". Kevin admits that Time Gentlemen, Please represents "a moving on for me from the far left causes which I used to support". "From the age of 15 to 27 I was an active Trotskyist," he says. "I was the leader of the anti-poll tax campaign in the London Borough of Enfield when I lived there. From the age of 27 until, say, 38, a couple of years ago I thought it was a pity socialism was clearly now not going to happen. I was in a kind of mourning, I suppose. But now I think that, for all its faults, the society we have is far preferable to anything the 'comrades' would bring, were they, Lord protect us, ever to stumble into power." Yet it would be a mistake to think Kevin has suddenly had the tragedy/bad taste to become Galway's Christopher Hitchens. Far from it. "I don't like George W Bush. I don't support the Iraq war," he declares. He was featured in the 100 Poets Against The War Anthology and retains his admiration for the writings of Leon Trotsky and George Orwell. Indeed Kevin is something of a Galway George Orwell - a man firmly of the left, but never a blind, sycophantic, adherent. "I think I have held firm to my principles, while at the same time evolving but I think the far left have abandoned many of theirs," he says. "I have seen in practice too that issues such as workers rights, a basic fundamental issue for anyone who claims to be on the left, have been abandoned by elements of the Galway left in favour of building an 'anti-war' alliance which contains all sorts of questionable elements. "There is more to politics than the Iraq war; and America isn't to blame for all the world's problems. The other thing that has really struck me is that, these days, the far left seems to be dominated by bullies. People who are more interested in browbeating than reasoned argument." The influence of Orwell runs deep as reflected in the poem 'Firewood'. "It was provoked by an article I read in Socialist Worker last year which said, among other things, that 'It's problematic to describe what's happening in Darfur as genocide'! I kid you not." In this moving poem, quotes from the article are juxtaposed with the growing fears of a mother who is stopped at a check point by armed men who may be soldiers or militants. Like that other left leaning admirer of Orwell, Billy Bragg, Kevin is more concerned by injustice against human life and dignity, and sees that as being above narrow political agendas. Yet, Time Gentlemen, Please is never grim, due to Kevin's ever present self deprecating humour. "I always believe that even the worst situations can be rescued by a laugh," he says. "Humour and wit - often of the blackest variety - are very important to me. I'd never want to be one of those serious, serious poets." Neither is the collection entirely political. It is often quite personal. "In poems such as 'Dad', 'Family Dispute', and 'Memory' I look at my relationship with my father, which has not been easy. In 'Dad' I try to see things from his point of view," says Kevin. "'Tuesday' sends up the foibles of middle-aged men, of whom, at the age of 40, I am now one. "In 'She Considers His Proposal' I satirise myself. It's a poem in which I say to my wife Susan: 'if you had known what you were getting into, would you have still said yes?' I think it's crucial not to take yourself too seriously." Time Gentlemen, Please is published by Salmon Poetry. All are welcome to the launch. The least controversial definition of poetry is 'writing that doesn't go all the way to the right-hand side of the page' - which, given the parlous state of the rainforests, demands a greater justification for publishing it. But this book would pass any such test without breaking sweat, containing a substantial range of poems that bring a smile to the lips and a spark to the imagination. Readers of this magazine will know of Kevin Higgins in poetry and in prose, and his second collection confirms him as a poet the left should be listening to. Often he deals with the usual material of poets always and everywhere: love requited and unrequited, the successes and failures of human relationships, nature, death and the rest. Anyone who avoided these would be no poet at all, and these eternal themes are treated here with an originality born of having lived and considered experiences, an originality that evokes recognition. It is an unusual but quite refreshing thing to note about a poet of the left, but in his first collection The Boy With No Face (also published by Salmon, in 2005) Higgins actually succeeded better with such 'non-political' poetry than with the 'political'. (Those quotation marks are there to signify the fluid and ultimately invisible boundary between the two, but you know what I mean.) Here, however, no such dissonance can be heard, and his political poems break higher ground. It's not just that he avoids the pitfalls of versified sloganeering - although that is still something to be grateful for in itself - but that he doesn't become any less poetic for being political. It's nineteen eighty two and I know everything. have to mow the lawn first. Instead of masturbation, I find socialism. the minute I become Commissar. Likewise, in 'To Curran's Hotel' (p 34) the demolition of a local pub brings to mind left-wing meetings attended there rather than pints sunk and girls scored there. While other poems testify to someone who is no stranger to the usual ups and downs of personal life too, the particular swings and arrows of a life lived on the left are as fit a subject for poetry as anyone else's. A tense and awkward father-son relationship is painfully familiar, but 'Dad' (p 42) tells of one with politics added to the mix. Son tells father that all his ideas are wrong, to which father replies that if son had his way, Moors murderers would be let free to promote their memoirs. But in the end the son all but thanks his father for deciding to "allow me / to keep contradicting myself / until I find out what it is / I'm trying to say". This kind of self-deprecation in the presence of world-historic significance is rare but essential for any sane socialist, the injunction from the Parisian barricades to take the revolution seriously but not take ourselves too seriously. your machine gun tongue and fire! But where do you go if you don't go down these roads? 'Death of a Revolutionary' (p 39) describes a socialist leader carrying his "plastic bag / still packed with propaganda, / but the world going the other way". While there was a time when "My every thought [was] part / of your master-plan", the poet sits and concludes that "I do not say, as you did: / 'We have kept the faith.'" Is this a rejection of a specific type of socialism, or of the whole idea of it? When you listen to The Who's classic 'Won't Get Fooled Again', you ask yourself whether this embittered look back in anger at 1968 and all that is a denial of revolution or a call for a better one. As the sublime Keith Moon drumming duels with the intelligent synthesiser, you draw your own conclusion, whatever Pete Townshend intended notwithstanding. It is only right that poetry throws up tough questions without easy answers, the ambiguity forcing you to think for yourself - and the poet's own reading is not the only one possible. of a doomed member of the Baader-Meinhof. on the Essex side of the M25. 'The Candidate' (p 58) saw only the choice of "making up worlds that will never be or grow up to be / Junior Minister for Counter-Terrorism". He chooses the latter, and dreams of persecuting those who didn't. 'Firewood' (p 61) is a good example of poetry reaching the parts that prose cannot. Eyewitness accounts of the genocide in Darfur are interspersed with glib comments from the wings (the left wing, unfortunately) like "It's problematic to describe this as genocide. / The solution is not military intervention." The common response to such horrors calls out for something or someone to go in and do something. While the US Marines are unlikely to improve anything they touch, the simple humanitarian instinct is ultimately far more worthwhile than the unfeeling rehearsal of pat slogans from a safe distance. To express the contradictions, doubts and tensions involved here is difficult, but this poem does a good job of it. 'Careful Driver' (p 84) provides the one line that exhibits a plain lack of imagination: "a bad week in Bognor Regis". Now, I've never been to Bognor Regis, but I've a feeling that Kevin Higgins hasn't either. To employ that much-maligned English seaside resort to conjure up humdrum mundanity smacks of the tired clichés of 1970s comedy with all its frilly shirt fronts and inaccurate Frank Spencer impersonations. But the fact that this slip stands alone among seventy-odd poems underlines that here is a poet who sands and polishes his words, who probably has a load more not yet finished enough to earn the light of day. There are a couple of poems here just for us. The images and references will go over their heads in Poetry Ireland, but us socialists can catch them if we keep our eyes open. 'The Interruption' (p 16) stands in a long line of poems inspired by works of art, but the picture brought to life here (without being mentioned) is Boardman Robinson's 1918 cartoon where a dinner party of capitalists is interrupted by the hand of Bolshevik revolution. In 'Kronstadt, Winter Song' (p 32) "ghost insurgents / wander the white, / chasing remembered sparks / of Aurora". This image of Aurora works (as all the best literary critics say) on several levels. The aurora borealis is a fantastic natural light show, of course, and Aurora was the goddess of the dawn. But a socialist reader may remember that it was the ship Aurora that launched the attack on the Winter Palace in 1917. The Kronstadters longed again for the spectacular dawn, but it was a spectacular dawn of real workers' revolution. The left should hurry to welcome this collection. Here is poetry that we can identify with, that tells of our hopes and fears and doubts and questions, that puts our lives on the map too. The fact that one of our own can tell such stories in a way that is so powerful and satisfying is something to be proud of. Anyone who responds to good poetry will find in Time Gentlemen, Please a collection to read and enjoy, but socialists especially can learn more from it of what we are and what we need to become. ...wonderfully inventive imagery: "the vast / unforgiving tundra of your politics" (Conversation with a Former Self); "leaning back in that chair / as if your bowels were about / to shout 'This is your Captain speaking!'" (Forecast); "Since love took its clown questions / and vomit-coloured clothes down / the fire escape that dusk" (The Great Depression); "as morning crashes / through the curtains like a man / who'd be happy to beat your head in / with a metal pipe, no questions asked" (A Previous Engagement)"
The most successful poems are those in which he writes at some length about other people: his father (Dad), lives that are summed up in deaths (Ending Up and Wholesale Clearance: Everything Must Go), the riotously funny Social Realist Poetess Celebrates Birthday, and above all Death of a Revolutionary : Ted Grant (1913-2006). Grant was a life-long English Trotskyist, one of the founders of Militant Tendency. Higgins recalls listening to him as a youngster: "My every thought, part / of your master-plan". The poem ends with a beautiful echo of 'By the waters of Babylon': "I sit by the water / in this town of Sunday painters. / I do not say, as you did: / 'We have kept the faith'." Laurie Smith teaches part-time at King's College London. like artificial Los Angeles snow. Hate him, breathless and red faced as ever. You taking the world warmly by the throat. Look closely and as well as assonances on 'snow' and 'throat', and 'breathless' and 'ever', 'face' and 'always', there are various alliterative groupings and echoes on Rs, Ts, Ws and Hs. Higgins is an accomplished performer of his work, a winner of several major slams, and this aspect of his work should not be understated when discussing his work. Indeed, the page never tells all the story with Higgins and to make the poems really live, you have to hear Higgins deliver them. that, in the end, he slit his own." Once or twice, the book could have done with a little tighter editorial eye, sometimes the same image recurs in too close proximity - for instance, clearly there is some fascination with three-bar fires, which occur in at least three poems, two of which are very close together. Perhaps they hold some symbolic association for Higgins, and are connected with the 'sad man in the caravan' who he says 'keeps coming back', but there appears to be a variety of association. The three-bar fire is used in symbolic nourishment where bread is toasted on it. It is next used as a symbol of run-down Bohemian chic, and thirdly as a way of describing sexual heat. Each image works in its own poem, but perhaps within the same book the repeated use is a little obtrusive. That said, one tends to forgive Higgins his minor transgressions because the work is so joyously dark and funny. He is the only one of my Irish contemporaries who makes me laugh out loud regularly, not just because the work is funny, but because it has that great sense of character behind it, where one pictures the speaker in all his curmudgeonly grumpy-old-man-ness glaring at the reader wondering what the hell they're laughing at! In the 1980s Kevin Higgins was living in England where he was active in the opposition to the poll-tax, an anti-working-class measure which brought thousands onto the streets. Now he organises poetry events in Galway. There is no contradiction here - Higgins is an unusually political poet. He has read his poetry at a number of different venues; it also works well on the page. like a dentist's drill, screaming to a start. Charles Manson to sing them another song. it's the Petrograd of the British Revolution. from Grosvenor Square to here. for a piece of the action on the new Moscow stock exchange. "We have kept the faith"
I'm reminded of WB Yeats's sad acknowledgement in 'Easter 1916' that the heroes of the Rising possessed a commitment that he could not share. tossed Robert Maxwell off his yacht. Reading these poems it's easy to believe Higgins when he says he's interested in 'the problematic intersection between literature and politics' and also in 'anyone with a black sense of humour.' Many of the poems in The Boy With No Face turn on a bleak joke. Sometimes it seems as though the courage needed for political confrontation has taken the form of a daring wit, a bringing together of images and ideas from which a conventional thinker would draw back. who thought the rain would stop soon." Getting close to these poems, I have become aware of the author's craft - for instance, where he puts the emphasis in a line, where he ends it in relation to others, how what appears to be spontaneous energy is, in fact, the result of careful technique. It's the energy that draws us in. The world and its inhabitants may be hopeless - Eleanor Rigby wanders into Desolation Row - but the movement of the verse is forward. doesn't mean we can't hold hands." He begins to admit the possibility of happiness and in 'Living Proof' for Susan he moves from a matter-of-fact account of himself waiting at the end of an aisle on his wedding day to the lyrical last lines: "This best June day. The sun extravagant, the music starting to play." It's obvious that the quick-witted satire and the political acumen are part of a very thoughtful intelligence. Some readers may wish his work to develop into something more weighty and serious. But Kevin Higgins's directness, humour and total lack of reverence have made him successful in performing to a wide audience and reaching people who would normally not read or listen to poetry.